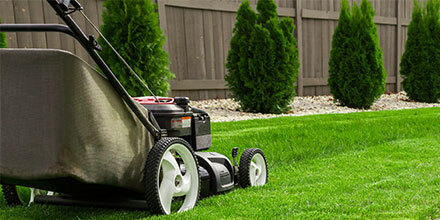 As the sun appears, the need to take out your lawn mower becomes more frequent. So whether it’s a joy or a chore, we’ll teach you how to mow grass correctly in summer with our handy guide below. First things first, it’s important to realise that mowing your lawn correctly increases lawn quality, decreases weeds/disease and helps to keep up a lawn's appearance. Remember to regularly service your lawn mower and keep the blades sharp! After each cut clean out the undercarriage and empty the clippings bag. Mowing during summer months As the weather really begins to warm up in May and June, your lawn will require frequent mowing. For lawns which include varieties such as Perennial Ryegrass, usually hardwearing and family friendly grasses, aim for a blade height of 4cm which is the medium level on most mowers. For fine leafed, ornamental style lawns which include a high proportion of fescues aim to cut to a height of 2cm. In July and August the weather conditions can affect the growth habits of your lawn. Generally, in Southern England you may find your lawn will grow at a slower rate as it is quite dry and usually warmer. If this is the case we recommend you continue to cut it at least once every two weeks. If you are based in northerly parts of the UK you may find regular cutting is still required right through the summer. Be aware your grass can be temperamental in very hot weather. Best practice is to raise your mower blades up, close cutting may damage the grass. If the lawn is not growing at all due to drought conditions then do not attempt to cut it. As the weather begins to take a downturn we find light rains can boost growth in grass again during late August and September. Mowing rate will be similar to May and June. This time of year creates the perfect conditions for moss growth with the heat and the moisture. You may want to consider applying a Feed, Weed and Mosskiller and it is also good practice to keep your lawn at a higher blade level. Check out our video guide on How and When to mow grass here.